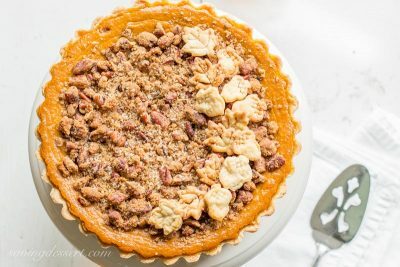 Pumpkin Tart with Pecan Crumble ~ a surprisingly unique and delicious tart with a cream cheese pumpkin base and a sweet, crunchy crumble top loaded with toasted pecans. Our post is sponsored by Nielsen-Massey Fine Vanillas & Flavors but all opinions are my own. Thanks for supporting the brands that keep SRFD in the kitchen! This isn’t your same old pumpkin dessert folks! It may look like your favorite autumnal pie, but you’ll notice the difference at the very first bite … this is a special treat. There’s something about the not-too-sweet filling made with cream cheese and pumpkin puree that creates an incredible texture and a fluffiness not found in the standard pumpkin pie. The sweet vanilla crumble top with toasted pecans is so unexpected, you might be asking yourself why you don’t top all your tarts like this! When baking festive holiday recipes, I believe it’s especially important to choose pure ingredients with rich, complex flavor profiles, such as Nielsen-Massey Vanillas. Simple can sometimes be the best when it comes to baking and there’s no doubt that vanilla tastes best when its natural essence is allowed to shine. Did you know that all Nielsen-Massey products are all-natural, certified gluten-free, certified Kosher, allergen-free and GMO-Free? Nielsen-Massey uses as few ingredients as possible when producing its pure extracts to create the highest-quality product available. 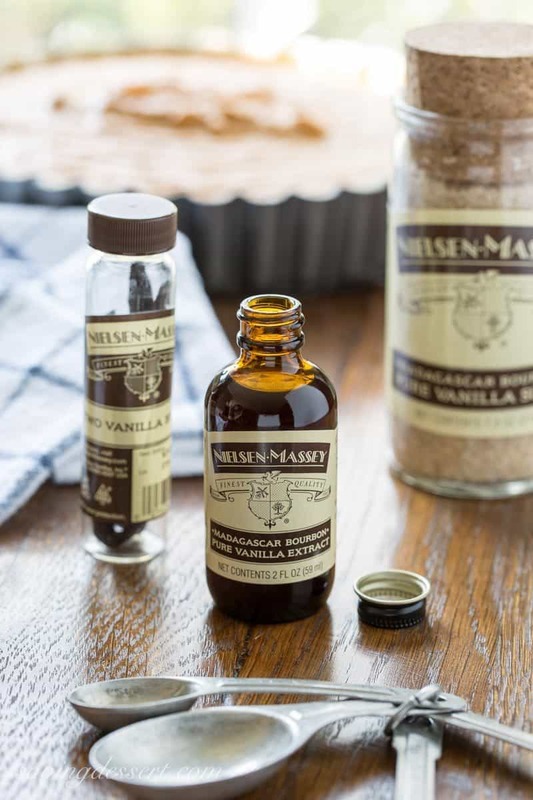 The Nielsen-Massey Madagascar Bourbon Vanilla used in this recipe has a sweet, creamy flavor with velvety after-tones and makes for an excellent “all-purpose” vanilla, perfect for all your sweet or savory recipes. 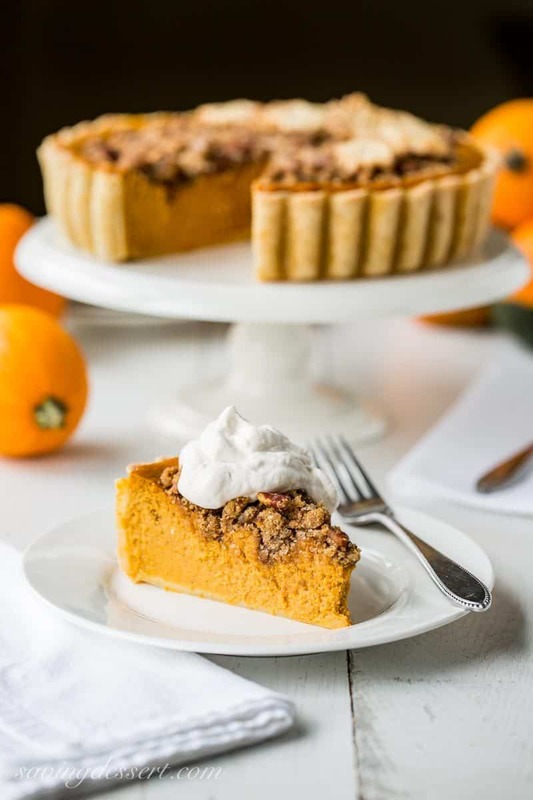 Our Pumpkin Tart with Pecan Crumble is made with a single pie crust recipe. I highly recommend using half of my Perfect Pie Crust Recipe. It has just the right amount of dough, and you can freeze the other half of the pastry for later. I hate to waste anything so the little bit of pastry scraps were rolled out and cut into festive leaf and acorn decorations. Or, you can roll out both single crusts for two 9-inch deep dish pie plates (instead of this tart pan) and divide the batter into two pies. Just because you don’t have a deep dish, fluted quiche or tart pan doesn’t mean you won’t be able to try this recipe! The simple pecan crumble adds a nice contrast to the cheesecake-like texture of the filling. 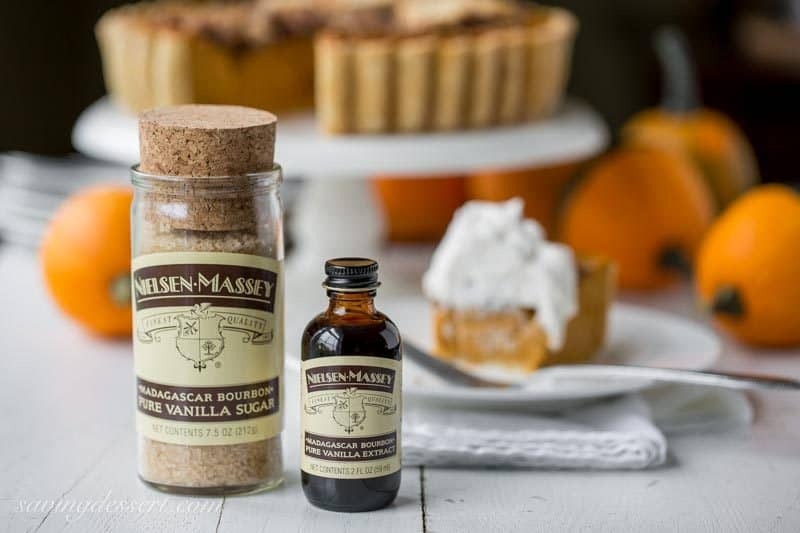 While you might be tempted to skip the Nielsen-Massey Madagascar Bourbon Pure Vanilla Sugar sprinkled on top, I believe this one little teaspoon of gourmet sugar sends the vanilla flavor over the top. Once your have a jar in your pantry, I know you’ll find a hundred ways to incorporate it in your everyday recipes. Vanilla Sugar is ideal for baked goods such as cookies, cakes, pies and pastries where it can enhance the vanilla flavor. It’s also great sprinkled in beverages, such as coffee, cocoas or smoothies, or as a sweet topping for pancakes, fruit or cookies. Don’t forget the dollop of pumpkin pie spiced whipped cream on top! For this recipe, I used 2 teaspoons of Nielsen-Massey’s Madagascar Bourbon Pure Vanilla Extract and 1 teaspoon of Nielsen-Massey Madagascar Bourbon Pure Vanilla Sugar. Simple ingredients, big flavor! You’ll want to go ahead and follow Nielsen-Massey on social media for plenty of holiday recipe inspiration. Be sure to check out their Facebook Page for the latest recipes, news and product updates. I didn’t even know they make a Pure Chocolate Extract! That seriously sends my creative mojo into overdrive 🙂 Don’t forget, Nielsen-Massey is also tweeting away for the holidays and posting plenty of deliciousness on Instagram too. For best results, store Nielsen-Massey flavors in an airtight container at room temperature and away from direct heat and sunlight. Don’t put them the refrigerator or freezer, as refrigeration or freezing will speed up the natural separation of the ingredient from the liquid base. 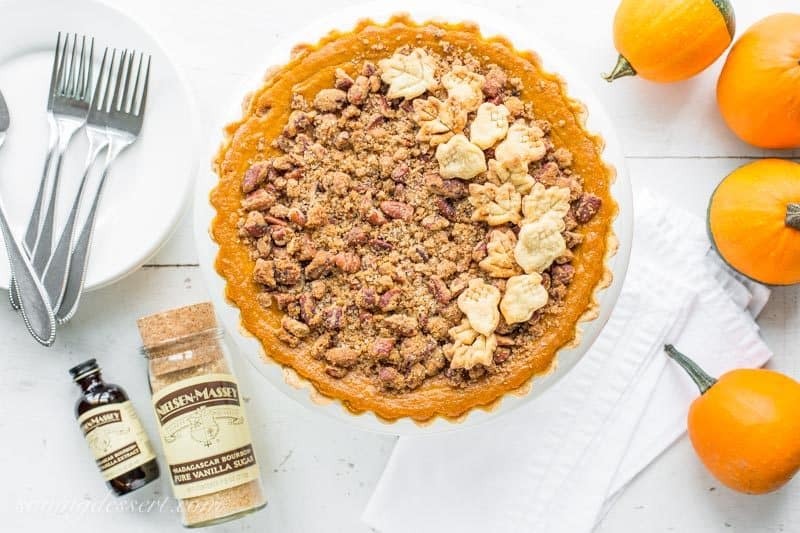 A surprisingly unique and delicious tart with a cream cheese pumpkin base and a sweet, crunchy crumble top loaded with toasted pecans. Preheat oven to 350 degrees. Roll out the chilled pie pastry on a lightly floured, clean work surface large enough to fit a 9-inch deep dish tart or quiche pan (2-inches + deep) with a removable bottom. (See notes to use a regular pie plate.) Press the pastry into the pan making sure you push the dough into the fluted edges. Refrigerate while preparing the filling. In a large mixing bowl, beat the cream cheese until fluffy. Add the pumpkin and beat until combined. Add the granulated sugar, brown sugar, pumpkin pie spice, and salt and beat just until blended. In a medium mixing bowl, whisk together the egg, egg yolks, melted butter, evaporated milk, and vanilla extract. Add the egg mixture to the pumpkin mixture and beat just until combined. Scrape the sides and bottom of the mixing bowl with a rubber spatula and blend one more time, about 30 seconds, to incorporate all ingredients. Place the prepared tart pan on a foil lined baking sheet. Carefully pour the filling into the crust and bake for 1 hour (the pan will be very full). Depending on the size of the tart pan you use you may have about 1/2 cup of filling leftover. Pour the extra batter into a lightly sprayed, small baking dish and place in the oven with the tart and bake for about 20 minutes. Enjoy taste testing the tart filling! While the tart is baking, prepare the Pecan Crumble. Place the pecan pieces in a clean/dry non-stick skillet over medium heat. Toast the pecans, stirring frequently, until fragrant and slightly darkened, 3 to 5 minutes. In a small bowl stir the toasted pecan pieces, brown sugar, flour, butter, cinnamon and salt until well combined. Set aside until needed. The vanilla sugar will be sprinkled on top of the crumble once added to the tart. After 60 minutes of baking, carefully remove the tart from the oven and sprinkle with the pecan crumble mixture, then top with the coarse vanilla sugar, if using. Return the tart to the oven, reduce the heat to 325 degrees and bake another 30 minutes or until a small, thin knife inserted in the center comes out clean. Cool completely on a wire rack. For best results, cover and chill for about 8 hours or up to 24 hours before serving. To serve with whipped cream, combine the whipping cream with the pumpkin pie spice in a medium mixing bowl. Beat on medium-high with an electric mixer until foamy. Add the powdered sugar, 1 tablespoon at a time, beating until soft peaks start to form. Add the vanilla extract and beat just until soft peaks form. Serve each piece with a dollop of whipped cream. There is too much filling for one regular pie, so if you don't have a deep dish, fluted edge quiche pan with a removable bottom, bake this in two regular pie pans. If baking as two small pies, you will need to reduce the cooking time to about 50 minutes or until the center is set. You will also need an additional pie crust pastry. Check our link to Amazon to purchase this inexpensive pan. Since the crust is not pre-baked, it's not crispy but is sturdy and soft. It's very similar to other pumpkin pie crusts. My pantry is stocked with my favorite Nielsen-Massey Fine Vanillas & Flavors, I’ve replaced my baking soda and baking powder with new fresh products, and we’ve loaded up on our favorite unsalted butter. Let the holiday baking begin! Finally, if you’re looking for more pumpkin inspiration – we’ve compiled all our favorite pumpkin recipes in one place for easy pursuing. Happy baking! The filling. The crumble. Everything is perfect! Thank you Brianne! This is a favorite dessert for sure. Pumpkin desserts are my favorite this time of year — that crumble seals the deal! It really makes this pumpkin tart something special. Thanks for stopping by! I love the crumble on this pie! Thank you Natalie! The crunchy topping is a really nice contrast to the creamy filling. Toasting the pecans makes all the difference so don’t skip that step if you get the chance to make it! Seriously salivating looking at this luscious pie, Tricia! That pecan crumble is such a brilliant idea and I just know it’s delicious. I can’t wait to give this a try! 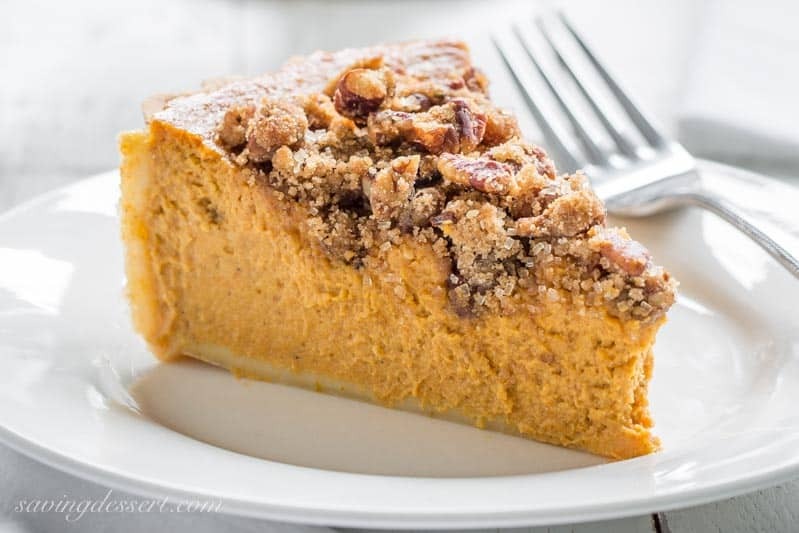 Looks like a delicious change from plain ole pumpkin pie. Thanks Larry – it really is terrific. Wow, Tricia, this looks so delicious and I love your spin on a traditional recipe. I’m certain that I would prefer the flavors of this gorgeous tart – perfect! Thank you sweet Robyn! Have a lovely weekend and thanks for sharing! Wow, you’ve inspired me to amp up my pumpkin pie crust this year—your tart is gorgeous! That’s a real compliment coming from you Liz – your desserts are always gorgeous. Thank you! Oh, this looks spectacular Tricia. I love that it’s not the same-old, same-0ld pumpkin pie! That’s my favorite vanilla too! So good! Everybody loved this tart Chris – such a nice change for sure. Thanks! Saw this beauty on Instagram first and all I can say is wow! looks fabulous and I love all the different components. Wish I was your neighbor! I wish you were too Cheri – I would have shared with you 🙂 Thanks so much! Wow, this is just sensational! It it such a classy dessert and I love how it’s familiar yet unique. The filling looks incredibly creamy and the crunchy pecan topping is a great contrast and bound to be a big hit. It’s definitely a showstopper for the holiday dinner table. And I hold all my Nielsen Massey vanilla products very dear! : ) I am totally wishing for that vanilla sugar in my stocking this year! Oh wow, this is the best looking pumpkin pie of the season! That’s the kind of pie you prey that there will be at least one piece leftover for breakfast 🙂 Nielsen Massey is one of my favorite companies…where would I be without their vanilla? Love this post, pinning and sharing all over! I adore Nielsen-Masse products, Tricia. 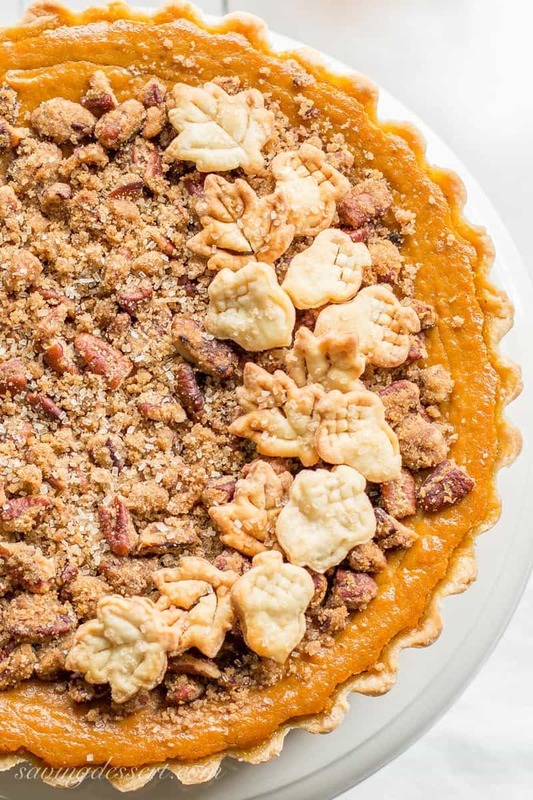 Your pumpkin pie with nutty crumble looks out of this world! Stunning! Love everything about this, as pumpkin is a favourite 🙂 That topping is fabulous. Thanks Jennifer 🙂 The topping is so good with the toasted pecans – you’ll probably see it show up again on another recipe!